A handyworker, handyperson, or a handyman, is skilled in doing reconstruction and repairs usually around a business or home. The tasks may vary and can range from labor on jobs to repairing a leaky toilet. 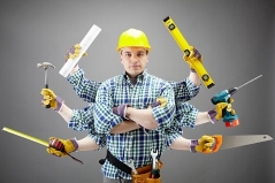 Here are some insurance options to help cover a handyperson and his or her business. One important item to consider is General Liability insurance. This can also be referred to as Commercial General Liability. This insurance coverage helps protect your company from another person or business’s claim of injury to body, medical claims, and casualty to property. Here are examples of claims that could happen to your handyman business. 1. You have an employee who is at dinner. This employee talks to the owner of the restaurant and provides false information. A law suit is made for slander. You can purchase insurance to cover your business up to the limits of your liability policy and could cover attorney costs as well. 2. You are working at a job to repair some antique mirrors in an older home. You accidentally drop one of the mirrors damaging the mirror and other antique artifacts in the home. Liability insurance coverage could cover such a loss and may even cover the costs to replace the damaged artifacts. 3. You are working in a home when the homeowner trips over your toolbox and breaks their leg. You can be liable for the costs. In this case, your liability insurance could cover the medical costs. *General Liability insurance can be purchased online from Business Insurance Quotes Agency if the payroll for your business less than or equal to $500,000. Coverage limits are available up to $2,000,000. Small monthly payments available. Certificate of insurance issued when purchased. These coverages should be adequate for most contracts that require a general liability policy. *Payroll and coverage limits are as of 08/15/2018.